4-page overview of Wessels Company’s wide range of top-of-the-line ASME and Non-ASME pressure vessels suitable for any application, including hydronic expansion vessels, air and dirt separators, glycol makeup packages, storage tanks, heat exchangers, filtration and many more. Check out Wessels Company’s extensive product catalog at-a-glance with this handy product linecard overview. Wessels manufactures a wide range of ASME and Non-ASME products servicing the hydronic and HVAC industries. Wessels patented HVAC expansion tanks NTA, NLA and NL are designed for use in hydronic heating/cooling systems to absorb the expansion force resulting from the changes in temperature of the system fluid. Wessels patented domestic hot water expansion tanks TX and TXA are designed to be installed between a backflow preventer and a water heater, so it can accept the expanded volume of hot water generated during heating and keep the system pressure below the relief valve setting. Wessels patented well water & pressure booster expansion tanks FX, FXA and FXT are for use in potable water well systems and booster pump applications to maintain system pressure when the pump is not operating and to increase the pump and water system life by reducing system cycling. Wessels WVA Air & Dirt Separators are designed to eliminate entrained air and separate debris associated with start-up and continuous operation of any hydronic system. The WesPlate Heat Exchanger consists of an ASME certified frame that contains a series of corrugated stainless steel plates designed to maximize turbulence and heat transfer. 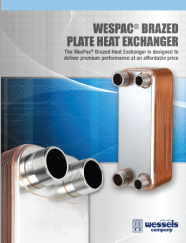 The WesPac Heat Exchanger features specially designed, corrugated plates that are bonded together with brazing material to make a solid, compact unit that eliminates the need for heavy pressure retaining components. 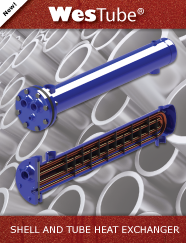 The WesTube Heat Exchanger consists of two sides for two different media. The Tube Side media flows inside the tubes and is diverted by the heat exchanger head located on the end into two or four passes or circuits. Glycol makeup packages function by automatically supplying pressurized water or water/glycol mixture to a closed-loop space heating, chilled water, snowmelt, radiant heating, or process control system. Wessels TXA-FF Full-Flow smart expansion tanks feature true flow-through technology that disrupts stagnant water, the breeding ground of dangerous bacteria. Increased temperature allowance and nutrient-resistant butyl provide additional protection. Wessels Primary / Secondary Headers are used in heating and cooling systems that require the primary and secondary loop of their system to be interlocked. The WessView© is the industry’s first diaphragm integrity monitor for diaphragm expansion tanks. This revolutionary, patented technology can be found exclusively on Wessels tank models NTA, TTA and FXT. Chilled water buffer tanks and Hot water buffer tanks for systems that require additional “buffer” capacity to eliminate problems such as excessive chiller or boiler cycling, poor temperature control, and erratic system operation. The Typhoon filtration system is engineered to remove solids from liquids. It offers revolutionary filter performance due to an innovative design that uses flow-diverging technology to separate dense solids before filter contact. The Wessels Condensate Neutralizer (WCN) is an acidic condensate neutralizer that is divided into three sections with easy-to-use bags of media in each chamber. The media bags feature helpful expiration labels to track performance. The Smart Tank Series with WessGuard© protection are ASME removable bladder tanks equipped with a proprietary monitoring system that alerts an audible alarm and led light when bladder integrity is compromised. Wessels has a wide range of top-of-the-line ASME and Non-ASME pressure vessels suitable for any application, including hydronic expansion vessels, air and dirt separators, glycol makeup packages, storage tanks, and many more.